Which type of zip do you prefer? I have to admit I am an invisible zip fan. My philosophy is that unless it is part of the design, a closure should be as discrete as possible, and for this reason I prefer the ‘invisibleness’ of an invisible zip. When I first started sewing, standard dress zips were all that was available and there was no other option. I constantly struggled with topstitching a straight line down the edge of the zip, especially around the zip pull. My recent adventures with vintage sewing patterns and their charming instruction sheets have brought all those distant memories back! 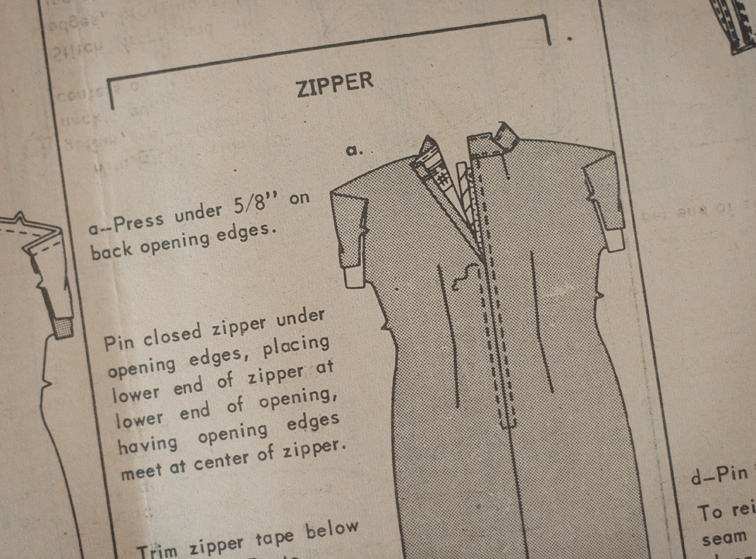 Do modern sewing patterns still use standard dress zips in their instructions? I don’t actually have any so I don’t know! I notice there are still large numbers of this type of zip in the shops, so somebody is using them. Now that invisible zips are so widely available, I don’t see any advantage in using a standard zip anymore. They are necessary for a fly-front application, but down the back of a dress or a skirt I don’t think anything beats the appearance of an invisible zip. I do appreciate a traditional handpicked zip like the method pictured above, but only for it’s quaint factor. I would handpick a zip in a vintage style dress purely as an era appropriate design feature. Even though handpicking is a couture method and often considered elite, I still think an invisible zip has a superior appearance. That’s my opinion – what do you think? Do you still use the standard dress zips, or are you an invisible zip fan too? I use standard zips in cushion covers, and as I type this I'm wondering why I'm still using them there- habit, I guess. I only use invisible zips in garments. I live in Cairns, Queensland so I'm not sewing any jackets or heavy fabrics. I have been wondering about this too, I just read on someone's blog that invisible zippers were not as sturdy as standard ones. My question is WHY? That didn't make sense to me at all. I love the invisible zipper, I still fight to get one put in nicely but like the clean line it gives. I'm really torn on this one. Invisible zips are infinitely more streamlined, but the old fashioned metal kind do have a kind of charm (quaint is the word), especially when lapped or hand-picked. Unfortunately, I find that trying to zip up a snug garment with an invisible zip almost always results in the slide tearing a hole in the zipper tape, which will catch the slide every time you try to zip it up and mock you until you replace the whole thing. A metal zipper, given the same amount of ease, will probably zip right up. On a slightly unrelated note, it's amazing how dainty modern zippers are compared to vintage ones. I have several lovely vintage dresses with the kind of zippers that nowadays are only found on couch cushions. I was converted to invisible zips several years ago and I've never looked back. I used to struggle immensely to get a regular zipper to look good. I always felt that regular zippers made my garments look homemade (in a bad, jr. high home-ec kind of way). The invisible zipper gives it a nice, clean, professional finish. I use either but more often a regular zip because that's what I have a lot of stashed away. I like the way the invisible zip looks but I had one break that made me quite mad –it wasn't too tight a garment either. 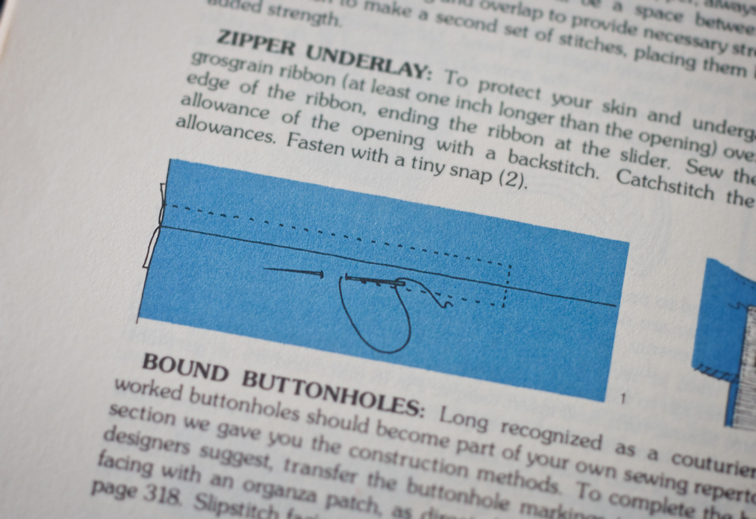 Some modern pattern instructions give the directions for both type zippers. And I agree with Megrims! I have a vintage dress with the biggest ugliest silver metal zip in it! And it's a lace dress! Invisible zips all the way, agree with everything you said. and the color is another issue – I can never find some matching colors, particularly in the red or rose family. But invisible zip solves that issue. I with you, invisible all the way! I haven't even put a standard zip in, don't see the point unless as you say its part of the design. I agree. Zippers should be as unobtrusive, that is, discreet, as possible. I agree with you, but invisible zippers ALWAYS give me problems and need to be unpicked two or three times, so it's a love/hate relationship. I decided I'm going to try a handpicked zipper for my next project and how that turns out. I really rather like the appearance of a lapped zipper in the back of skirts but then I am probably showing my age – it makes me feel nostalgic! If I am sewing a denim or heavy cord skirt then I use a side lapped zipper because pulling an invisible zipper through a thick facing is no fun. I do use a lot of invisible zippers – though I have never been able to get the top to sit correctly, even putting it too high so the metal part pulls out, or too low so I have to add a hook and eye closure – so I actually find them a bit trickier to handle. Also my Bernina's invisible zipper foot is a bit tempermental. I never thought about it until you mentioned it, but a perfectly sewn old fashioned zipper has a lot of appeal to me! Invisible wherever possible! I find that even in tightly fitted strapless dresses they're fine as long as the dress has a separate understructure – the dress is a fraction bigger than the understructure which takes the strain. I did have one break while I was making a VERY tightly fitted dress for someone and since it had straps I didn't make a separate understructure. The zip popped at the final fitting. I swore, and learned my lesson! I hate putting in zippers with a passion, but maybe that's because I've yet to put in an invisible zip. Yes, modern patterns do call for regular zippers. In fact, I think most of the time. I like handpicked zippers. An invisible zip is on my list to do. Love invisible zippers for all the reasons you stated, I just love them. Invisible zips has my vote. I would love to buy some RiRi zips (not invisible) – but they are so expensive. These zips would be for decorate purposes only. My vote is for invisible – if it's there for closure, then the zip should be enclosed too. I do love the look invisible zippers offer, though they give me such fits and are about the most rotten things to put in that I've ever used. I also find that in comparison to traditional zippers they are not as sturdy either. I wish they still produced zippers in metal rather than the nylon teeth as I think that these are definitely inferior to a long lasting metal zip. Still, I endeavor to use invisible zippers in some things. I've recently become very enamoured of traditional zippers handpicked and lapped. They offer much more stability, are easier to put in and rather beautiful, if I do say so. I don't know. I think it depends on the person. Some people don't have any trouble with invisibles and some couldn't have more. I think whether someone has trouble or not depends on their technique and equipment. (Some lady once yelled at me that she was fed up with invisibles and she wanted me to teach her lapped. I looked at her feet and she had been trying to use a piping foot to apply the zip. So of course it looked like crap.) I only teach invisibles and though some people need to “get the hang of it,” my students all end up putting in perfectly invisible zips. Anyway, I think you know my answer. I agree with you – I almost always use an invisible zipper. Personally I find them much easier to insert. I like invisible zips but I am finding that the ones I buy from Spotlights do not last long…and who wants to rip out a zip and put in a new one after just a couple of wears? So I need a better supplier for my invisible zips. Oh, I'm quite the opposite! I only like regular zippers.. and I hand-pick them, so they look nice and the crossing seams line up easily! I especially like old metal regular zippers with the teeny metal teeth. I like their strength and durability, and I like having control over the hand-picked opening, and that they're easier to replace that way. Invisible zippers break a lot for me, probably due to having a larger backside! I also find them prone to 'sticking' or jamming or sucking in bits of fabric. Fascinating to read that most people prefer them. Great discussion topic! I actually like the look of lapped zippers too, and they're super easy to install! I always use invisible zips in dresses unless I'm making a real feature of the zip, and find them much easier to insert than regular ones (thanks to my machine's brilliant invisible zip foot). It's difficult to find them round here. The local sewing shop stocks them but they seem to sell out quickly and don't often restock. The only brand available is YKK which seem to be good quality. I've never had one break either but then I don't make many very closefitting garments. Although I'm now thinking I should give the traditional version another go – maybe it's just a case of needing practice at putting them in. I'm with Tasia on this one. Though I'm a novice and haven't ever machine stitched a zipper. 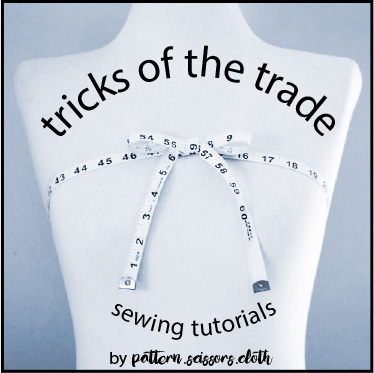 Before I got my sewing machine I had read Tasia's tute on the hand picked zipper so it was the first thing I tried and I just loved the control of it. Maybe if I ever took some sewing lessons I'd learn how to machine stitch a zipper – whether invisible or not….and I'm probably limiting myself…but I just like doing zippers by hand. I am definitely an invisible zip fan too! I nearly always use invisible zips too, and only use dress zips for shorts and pants, and jean zips for jeans of course! And I've seen handpicked zips on old clothes and have to confess I've always thought they would look a whole lot better with a proper invisible zip inserted… the only reason they didn't use these wonderful things way back then was because they hadn't been invented! I love invisible zippers, if only I managed to sew them in nicely so they are actually invisible. Still struggling… might have to invest in the proper invisible zipper foot as I am struggling with the regular one… or just exercise a lot. I love regular zippers – I can control them a lot better and sew them nicely. My invisible zippers never turn out quite invisible, so they look ugly. I've never had a problem inserting a regular zipper and I like being able to put them in after I've sewn the rest of the garment. Karen – that's a shame you've had such problems with invisible zips – they shouldn't break! 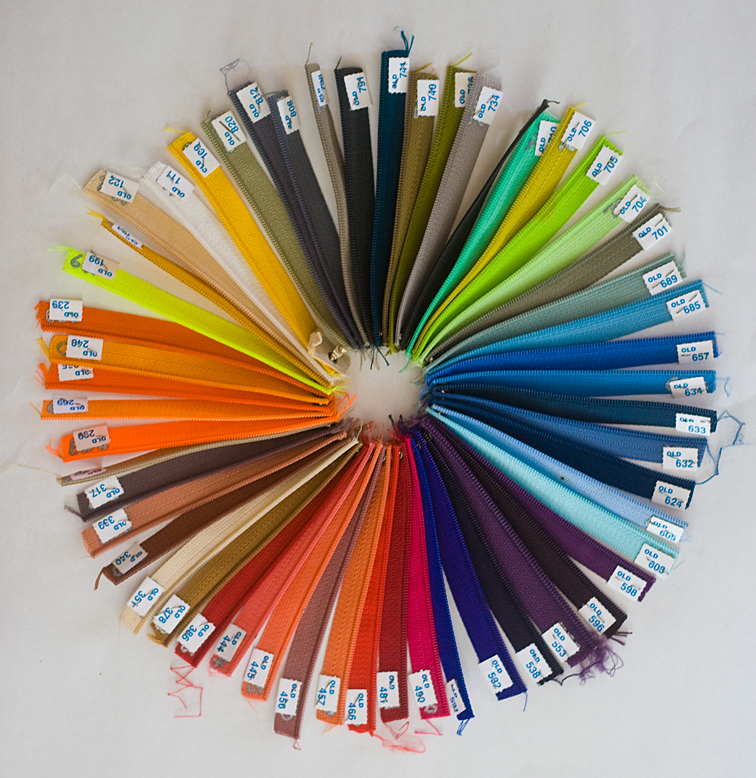 The brand I use (YKK) has never failed, unless I err, hit the coil with my needle…!